After the Chaos Wars, the Humans defeated the Dragons and ended the plot of Hades. Due to the death of both kings and all heirs to the two Human Kingdoms, political turmoil followed. In the end, a temporary regime was created, led my the cousin of Lucas——Ward Freeman；Odin as regent, having equal power as Ward. Huxley became minister. They renamed the Kingdom“Eternal Dynasty”，ruling over Human territory, Elf refuge as well as Orc occupied land. War was still taking its toll on the land, just as Sapphire was slowly recovering, a long plotted disaster came. Abyssal Tyrant Fergus with a huge army, emerged from the Abyss of Sin in the East and attacked the Human World. At the same time, the Plague Queen, under Fergus's control came in from the West with an Orc Legion. 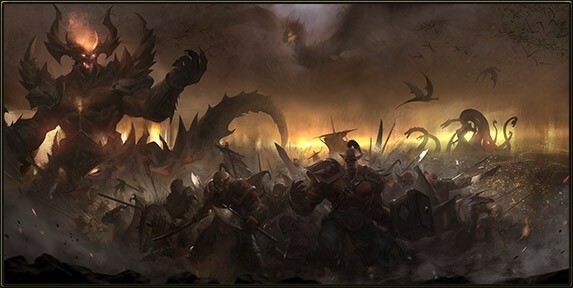 What's worse, Ulysses led his Dragons from the North, Humans were surrounded on 3 sides by the Abyssal Alliance. Faced with this unstoppable army, the Humans had no choice but to fall back to the Eternal City.